This was my first time trying shirataki noodles. They were okay for being a no calorie and no carb noodle. Just make sure you rinse them very well otherwise they have a fishy smell. I believe it is the liquid the noodles are stored in that have the smell. The noodles themselves are made from yam flour. The yam flour is not the yam / sweet potato we think of. It's a fibrous root plant from Asia. I got them here. 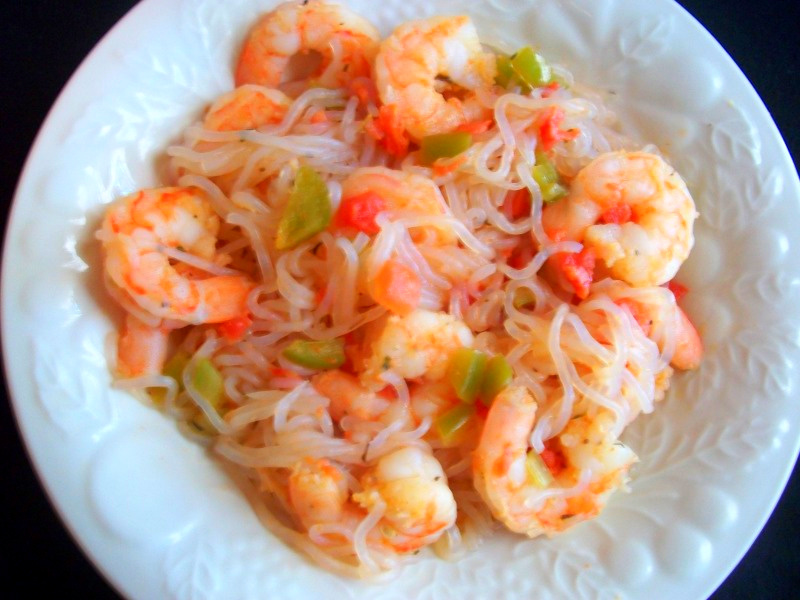 They do have another type of shirataki noodles that are made from tofu but they have calories and carbs. You can get them here. Make sure you rinse, rinse, rinse and then rinse them again in hot water. You don't cook them - just rinse them in hot water and then add to your dish. You can snip them into small pieces with scissors or you'll end up with noodles that are 3ft long. I rinsed them for a few minutes minutes. Then drained them and then rinsed again for a total of 5 minutes. I loved how this dish turned out. I liked the combination of the spices so much that I doubled the seasonings and saved some for later to use. Thaw frozen shrimp. De-vein and peel shrimp if necessary. Make the seasoning blend by combining all the spices in a small bowl. Drain liquid from noodles and rinse thoroughly; set aside. Preheat a large skillet over medium heat. Once pan is heated, add olive oil and stir in minced garlic. Immediately add shrimp, green bell peppers, and lime juice. Sprinkle the entire seasoning blend over shrimp and peppers. Stir. Saute shrimp and peppers 3 to 6 minutes. Add drained noodles and continue to saute an additional 2 to 4 minutes or until shrimp begins to brown and peppers are al dente (tender-crisp). Remove from heat, toss with tomatoes, and serve.